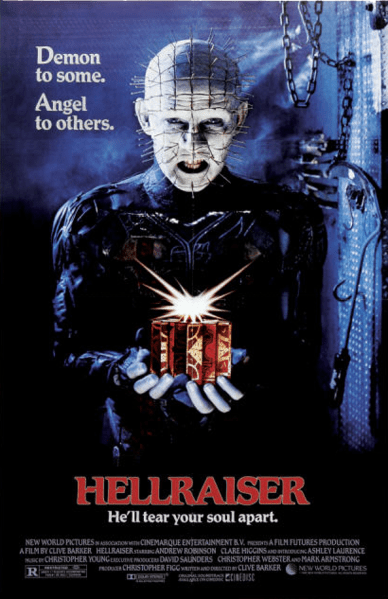 The original Hellraiser. The one that stands the test of time and actually has a coherent plot with a beginning, middle, and end. A unique, visceral experience written and directed by Clive Barker, based on his own novella “The Hellbound Heart” which I own and read many times [great read, short but effective]. The movie opens somewhere in Asia[?] with Frank, sociopath and sadist, purchasing The Lament Configuration, a puzzle box that once solved apparently opens the door to “endless pleasure” in the pits of heaven or hell, well mostly just Hell. In one memorable scene heavy with symbolism, Frank solves the puzzle only to come face to face with The Cenobites, four “demons to some, angels to others” who indulge in mutilation and torture, aided with the help of chains and hooks that appear out of nowhere, cutting and ripping flesh. In one gruesome sequence we see the Ceneobites playing with the left overs of Frank after his “session”, his face in pieces like a puzzle that female Cenobite has no problem solving. Frank is now a small splash of plasma between the floorboards in the attic of the home he half owns with his brother, Larry, who they inherited from mother. A couple months later Larry moves into the house with his British, uptight wife Julia, who has some secrets and pent up frustration of her own that we will come to discover. The house isn’t warm and welcoming, and literally reeks of rotten flesh left in the sink, covered in maggots and roaches. Julia isn’t impressed and is even less enthused when Larry’s daughter Kirsty joins them from abroad. After a vile accident involving the tearing of Larry’s hand on protruding nail during moving day, his blood seeps into the floorboards of the attic where it is used to bring Frank back from hell or wherever he was, but only so much that he is still practically a blob of seeping flesh. Here we find out that Julia had an affair with Frank and hasn’t gotten over him ever since, she’s obsessed, and after her minor disgust she agrees to lure men from Singles bars to Frank so he can kill and devour them until he has a completely new body. He better hurry though because thanks to our Hellraiser final Girl Kirsty who is no slouch and has discovered Frank and Julia’s diabolical plan and by accident, crosses paths with the Cenobites and agrees to give Frank to them in exchange for her own life. The Ceneobites don’t take to Frank escaping them too lightly. A fascinating and macabre horror treat from a truly original mind. This movie is filled with disgusting gore, bodies mutilated, a sludge pile reanimating into some semblance of a human body, and the Ceneobites themselves with all their horrific make-up and design [my fav is Chatterer] but there’s something that sets this apart from just being mind-numbingly disgusting. There is artistry to the gore, it’s actually part of the story and not there just for the sake of being there [leave that to part 3]. The scene where Frank comes back from Larry’s blood is a perfect example of how the gore and effects are thriving art on display. The themes are well thought out and the pace is always on. The movie just SCREAMS 80S!!! The Christopher Young soundtrack [a class act, I own it], the bluish lighting and Kirsty walking down the street with the wind blowing in her hair, or how about the awesome, intense “stalk” sequence with Frank and Kirsty in the storage room ending with a shot of a rotting face covered in maggots almost making Kirsty scream??? You can only find these endearing qualities in 1980s horror, I swear. I remember the first time I watched this with my mom and sister [I was 9] and I felt lot’s of tension throughout, something all the sequels lacked. There’s an ambiguous subplot involving a homeless man with a liking for munching on live crickets that is very odd and nightmarish, it creeped me out as a kid! This whole movie has many dreamy scenes and nightmarish sound design. Overall, a memorable 80s horror treat that oozes with art and imagination, and has some great imagery from frame 1 to end. LOVED the time lapse shots of the flowers on the hospital TV, very cool and backed up by a great editor.